Just in time for the holiday, Shortcut Maple Baked Beans are everything you want in a side dish: smoky bacon undertones, sticky maple sweetness, and a touch of late heat that lingers and balances it all together. 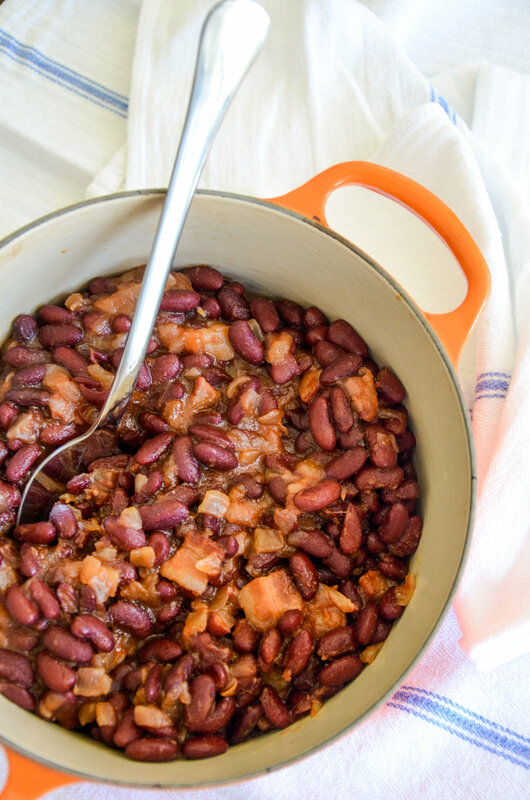 Shortcut Maple Baked Beans also happen to be the perfect compliment to whatever your Fourth of July menu holds. The best news? You can grab the ingredients on your way to the lake (or wherever you will be celebrating), whip these up in less than thirty minutes, and serve them for dinner right out of the pot. What is the shortcut? Instead of cooking dried beans (which, yes, does in fact take a long time), we are going to start with canned beans. The magic happens when we lay down a flavor foundation of bacon and onions, then simmer together a sticky sweet hot yummy sauce, and add it all together at the end. No one will know you didn't cook your own beans, and you will be the hero of your holiday table.